Brown Rockfish (Sebastes auriculatus). Image courtesy of NOAA. Rockfish have a biphasic life history in which pelagic larvae spend 1-2 months in the water column followed by settlement to benthic habitats that shift over ontogeny. In Puget Sound, settling rockfish are thought to associate with a variety of habitats including eelgrass, kelp, drift vegetation, and cobble fields, while many species as adults are found associated with deeper, high-relief rocky substrates (Palsson et al. 2009). While diet varies with species, developmental stage and location within the Sound, primary prey items for rockfish include Pacific herring, crabs, shrimp, surfperch, greenlings, and benthic invertebrates such as amphipods (reviewed by Palsson et al. 2009). In turn, rockfish, particularly as juveniles, are preyed upon by suite of predators including lingcod (Beaudreau and Essington 2007), salmonids and other fish (Palsson et al. 2009), while adults have been shown to be consumed by marine mammals such as harbor seals (Lance and Jeffries 2007). Although rockfish larvae are pelagic, there is genetic evidence for limited dispersal within Puget Sound for the quillback (S. maliger) and copper (S. caurinus) rockfish (Seeb 1998) as well as for differentiation from coastal populations of brown rockfish (S. auriculatus) (Buonaccorsi et al. 2002). This degree of population structure is consistent with other genetic and otolith studies from coastal Pacific rockfish populations (Cope 2004, Miller et al. 2005, Burford 2009). Because of these findings, populations of each species of rockfish in the northern and southern portions of Puget Sound are recognized by WDFW to be separate stocks (Palsson et al. 2009) (Figure 1). Currently, the Washington Department of Fish and Wildlife (WDFW) collects two types of data on rockfish in Puget Sound: those that are dependent upon information obtained from commercial and recreational fisheries (fishery-dependent data) and those that are based upon population surveys conducted by WDFW (fishery-independent data). The estimates of commercially removed biomass in Puget Sound are thought to be fairly accurate because documentation began in 1955 while recreational take has been monitored less consistently (Palsson et al. 2009). However, demographic data from the recreational fishery that inform the assessments of stock status for copper and quillback rockfish are collected by samplers trained by WDFW (Palsson et al. 2009). To obtain independent estimates of population abundances of rockfish, WDFW began conducting bottom trawls at a suite of sites in Puget Sound in 1987. The number of trawls for a given region has varied substantially over time (Palsson et al. 2009). Underwater video surveys are used to estimate biomass, density and distribution of rockfish. SCUBA transects are conducted along 30 m transects at approximately 25 sites in the North and South regions of Puget Sound (Palsson et al. 2009). Using the abundances and trends from all available fishery-independent data, Palsson et al. (2009) classified each rockfish species as Healthy, Precautionary, Vulnerable or Depleted. These status categories are based on those used by the American Fisheries Society (Musick 1999). For the two rockfish species for which demographic data were most available (quillback and copper rockfish), designations were made based on current Spawners per Recruit (SPR) relative to 1970s SPR (proxy for an unfished population) and 1999 SPR (Palsson et al. 2009). 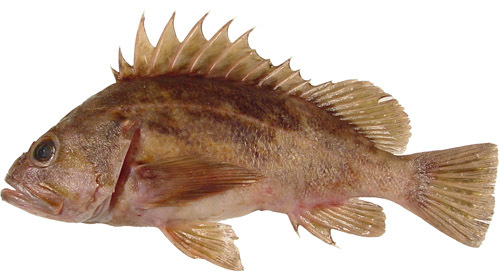 Canary Rockfish (Sebastes pinniger). Image courtesy of NOAA. The removal of rockfish from Puget Sound through recreational and commercial fisheries increased substantially after the Boldt Decision in 1974 when fishing restrictions were increased for salmon while rockfish were identified as a recommended alternative. Due to general declines in rockfish catches on the outer coast and to the petition for federal listing of 14 rockfish species found in the Puget Sound (Stout et al. 2001), commercial fishing for rockfish in Puget Sound has been restricted since 1999 and commercial catches have been negligible in recent years (Palsson et al. 2009). In 2002, any take of the yelloweye rockfish (Sebastes ruberrimus) and canary rockfish (S. pinniger) became prohibited. In 2004, the recreational daily limit on other rockfish species was reduced to a single fish (Palsson et al. 2009). In 2009, the Puget Sound populations of yelloweye and canary rockfish were federally listed as Threatened under the Endangered Species Act (ESA) and the bocaccio (S. paucispinis) was listed as Endangered. In addition to these federal listings, 14 of the 17 stocks of rockfishes in the North Puget Sound and 11 of the 15 stocks in the South Sound are currently designated by WDFW as Precautionary, Vulnerable or Depleted (Table 1). Table 1. Summary of the status of rockfish stocks in Puget Sound (WDFW) (Palsson et al. 2009). A new management plan has recently been proposed by WDFW which outlines several possible management options for rockfish in Puget Sound and is currently under review (WDFW 2009). One of the key components of this plan is the recommendation that quillback, copper, black, yelloweye, bocaccio, canary and Puget Sound rockfish be managed as individual species due to their importance to recreational fisheries, conservation concerns, or ecological importance (WDFW 2009) (Table 2). In addition to these proposed changes in management, there are currently 16 marine reserves throughout Puget Sound that include the rocky habitat thought to be beneficial for rockfish. Table 2. Proposed species of interest, habitats and reason for their selections in the Draft Puget Sound Rockfish Management Plant (WDFW). Puget Sound Rockfish (Sebastes emphaeus). Image courtesy of NOAA. Both commercial and recreational catches of rockfishes have substantially declined since the mid 1980s and 1990s in both the North and South Puget Sound (Palsson et al. 2009) (Figure 2). Bottom trawl survey data also show declines in the harvested species of rockfishes; the two species that have increased over time (redstripe rockfish, S. proriger and Puget Sound rockfish, S. emphaeus) are smaller-bodied fish that are not harvested (Palsson et al. 2009)(Figure 3). The estimated SPR ratios for copper and quillback rockfish in the North and South Sound have also declined dramatically from 1970s to 1999 in both the North and South Sounds (Palsson et al. 2009)(Figure 4). This metric is important because it reflects the effect of fishing pressure on the reproductive capacity of a harvested population. Many aspects of the ecology and biology of rockfish germane to their management in Puget Sound are not well understood. For example, ecological interactions such as predation may play important roles in determining the success of management strategies (e.g., Beaudreau and Essington 2007, Harvey et al. 2008), while demographic parameters such as age structure of populations (Berkeley et al. 2004, Berkeley 2006, Lucero 2009) or variability in the factors that drive recruitment rates are also likely to be quite important in driving the potential for rockfish recovery. Furthermore, while targeted exploitation of rockfishes in Puget Sound has diminished in recent years, the influence of continued threats such as pollution, altered food webs, incidental catch in recreational fisheries are not known. Rockfish form a diverse assemblage of fish in Puget Sound and throughout their range. In Puget Sound, rockfish have abundances decreased substantially since quantitative monitoring began in the 1970s. These declines have resulted in the federal listing of three species under the Endangered Species Act. Because of their diversity in habitat use, ecology and life history, single-species approaches to rockfish management in Puget Sound are currently being considered. Tiger Rockfish (Sebastes nigrocinctus). Photo by Chad King of the Sanctuary Integrated Monitoring Program. Beaudreau, A. H., and T. E. Essington. 2007. Spatial, temporal, and ontogenetic patterns of predation on rockfishes by lingcod. Transactions of the American Fisheries Society 136:1438-1452. Berkeley, S. A. 2006. Pacific rockfish management: are we circling the wagons around the wrong paradigm? Bulletin of Marine Science 78:655-667. Berkeley, S. A., C. Chapman, and S. M. Sogard. 2004. Maternal age as a determinant of larval growth and survival in a marine fish, Sebastes melanops Ecology 85:1258-1264. Buonaccorsi, V. P., C. A. Kimbrell, E. A. Lynn, and R. D. Vetter. 2002. Population structure of copper rockfish (Sebastes caurinus) reflects postglacial colonization and contemporary patterns of larval dispersal. Canadian Journal of Fisheries & Aquatic Sciences 59:1375. Burford, M. O. 2009. Demographic history, geographical distribution and reproductive isolation of distinct lineages of blue rockfish (Sebastes mystinus), a marine fish with a high dispersal potential. Journal of Evolutionary Biology 22:1471-1486. Cope, J. M. 2004. Population genetics and phylogeography of the blue rockfish (Sebastes mystinus) from Washington to California. Canadian Journal of Fisheries & Aquatic Sciences 61:332-342. Harvey, C. J., K. Gross, V. H. Simon, and J. Hastie. 2008. Trophic and fishery interactions between Pacific hake and rockfish: effect on rockfish population rebuilding times. Marine Ecology Progress Series 365:165-176. Lance, M. M., and S. J. Jeffries. 2007. Temporal and spatial variability of harbor seal diet in the San Juan Island archipelago. Research Agreement No. K004431-25, Contract Report to SeaDoc Society, Olympia, WA. Love, M. S., M. Yoklavich, and L. K. Thorsteinson. 2002. The rockfishes of the northeast Pacific. University of California Press, Berkeley, CA. Lucero, Y. 2009. A multivariate stock-recruitment function for cohorts with sympatric subclasses: application to maternal effects in rockfish (genus Sebastes). Canadian Journal of Fisheries and Aquatic Sciences 66:557-564. Miller, J. A., M. A. Banks, D. Gomez-Uchida, and A. L. Shanks. 2005. A comparison of population structure in black rockfish (Sebastes melanops) as determined with otolith microchemistry and microsatellite DNA. Canadian Journal of Fisheries and Aquatic Sciences 62:2189-2198. Musick, J. A. 1999. Criteria to define extinction risk in marine fishes - The American Fisheries Society initiative. Fisheries 24:6-14. Musick, J. A., M. M. Harbin, S. A. Berkeley, G. H. Burgess, A. M. Eklund, L. Findley, R. G. Gilmore, J. T. Golden, D. S. Ha, G. R. Huntsman, J. C. McGovern, G. R. Sedberry, S. J. Parker, S. G. Poss, E. Sala, T. W. Schmidt, H. Weeks, and S. G. Wright. 2000. Marine, Estuarine, and Diadromous Fish Stocks at Risk of Extinction in North America (Exclusive of Pacific Salmonids). Fisheries 25:6-30. Palsson, W. A., T. S. Tsou, G. G. Bargmann, R. M. Buckley, J. E. West, M. L. Mills, Y. W. Cheng, and R. E. Pacunski. 2009. The biology and assessment of rockfishes in Puget Sound. Washington Department of Fish and Wildlife, Olympia, WA. Parker, S. J., S. A. Berkeley, J. T. Golden, D. R. Gunderson, J. Heifetz, M. A. Hixon, R. Larson, B. M. Leaman, M. S. Love, J. A. Musick, V. M. O'Connell, S. Ralston, H. J. Weeks, and M. M. Yoklavich. 2000. Management of Pacific Rockfish. Fisheries 25:22-30. Seeb, L. W. 1998. Gene flow and introgression within and among three species of rockfishes, Sebastes auriculatus, S. caurinus, and S. maliger. J Hered 89:393-403. Stout, H. A., B. B. McCain, R. D. Vetter, T. L. Builder, W. H. Lenarz, L. L. Johnson, and R. D. Methot. 2001. Status review of Copper rockfish, Quillback rockfish and Brown rockfish in Puget Sound, Washington. NOAA Technical Memo, U.S. Department of Commerce. WDFW. 2009. Draft Puget Sound Rockfish Conservation Plan. Washington Department of Fish and Wildlife, Olympia, WA.